I can clearly remember making sand cakes and mud pies when I was little. Felt food would have been a much cleaner alternative! Material Munchies, created by a couple of Australian moms, brings a variety of material food to the table, and the creations all look good enough to eat! 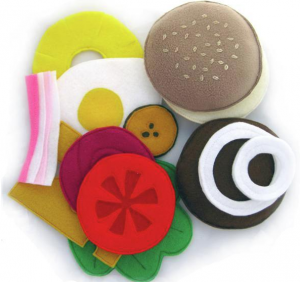 Among their collection is a sandwich pack, which includes 2 pieces of felt bread and all sorts of sandwich fixings, a hamburger, fruit, sushi, biscuit and even teabag pack. Apart from being able to host a fabulous tea party, Material Munchies are an ideal way to teach kids about food as well. As there are many different pieces within each pack, kids can mix and match as well, and imagine different combinations. Food and eating habits learned as a child can be with them their entire lives, and it’s a bonus when those lessons are fun! What could be better than being allowed to play with your food? Vapur ~ A Collapsable, Rollable, BPA Free Water Bottle! 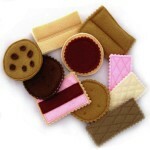 Yummy Felt Food from Pachom!